These graphics cards perform the same on paper, but have some key differences in prices and promises. The long-awaited GeForce RTX 2080 and RTX 2080 Ti are finally here, new “RTX” moniker and all, and well, they’re mighty impressive pieces of kit. Nvidia infused the radical Turing GPU at their hearts with dedicated RT and tensor cores to (hopefully) ignite a gaming future brimming with ray tracing and AI-enhanced graphics. The GeForce RTX 2080 Ti is the fastest graphics card ever, full stop. But I’ve heard plenty of people wondering: Should I buy a GeForce RTX 2080 or a GeForce GTX 1080 Ti? Nvidia’s new RTX graphics cards cost significantly more than their predecessors. But prices for the GeForce GTX 1080 Ti—Nvidia’s powerful, previous-gen flagship—have started relaxing in recent weeks after spending most of 2018 inflated by wild cryptocurrency demand. How do the two compare? Which Nvidia graphics card should you buy? Let’s dig in. GeForce RTX 2080 vs. GeForce GTX 1080 Ti: Fight! Nvidia says the GeForce RTX 2080 starts at $699. In reality, Nvidia’s own GeForce RTX 2080 Founders Edition costs $799 on GeForce.com, and custom-cooled, overclocked cards by Nvidia partners like EVGA and Asus usually cost more than that. There are some exceptions though. The Zotac GeForce RTX 2080 Blower “only” costs $750 on NeweggRemove non-product link, but it has a ho-hum plastic shroud and a single-fan, blower-style design—the very design that Nvidia’s Founder Edition cards dumped this generation. I’d suggest avoiding it. The Gigabyte GeForce RTX 2080 WindforceRemove non-product link and EVGA RTX 2080 XC GamingRemove non-product link each match the Nvidia Founders Edition at $800, and feature custom coolers more impressive than Zotac’s. Pricier cards include more potent cooling solutions and extra features, such as RGB lighting. The GeForce GTX 1080 Ti launched at $700 in May 2017. After a wild year of cryptocurrency inflation, that’s about where you’ll find most cards still pricedRemove non-product link. Sometimes you’ll find juicy deals that drop costs even lower. As I write this, Newegg is selling a beefy Gigabyte Aorus GTX 1080 Ti for $655Remove non-product link, while you’ll find the EVGA GTX 1080 Ti SC2—which we loved—for $690 and the Zotac GTX 1080 Ti AMP for $680 on Amazon. Which brings up a key point: At this stage of the GTX 1080 Ti’s life, the cards you’ll find for your $700 likely include impressive customized coolers and overclocked GPU speeds. Bottom line: You’ll spend at least $100 less for a GTX 1080 Ti, and you’re probably going to get a more impressively designed card for your money. 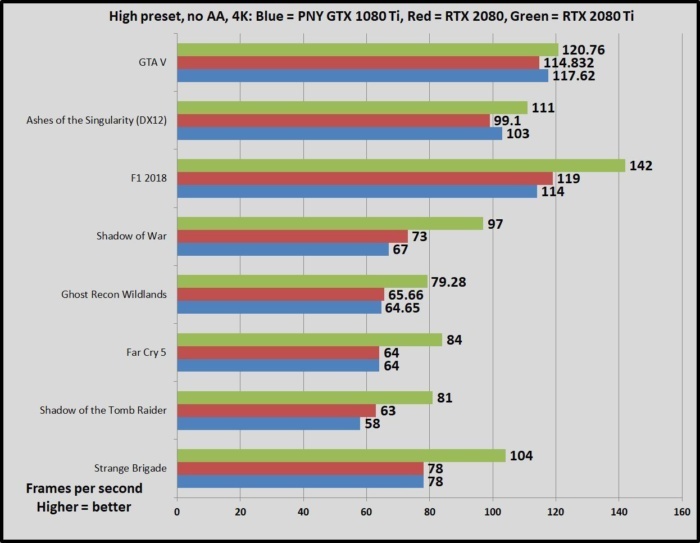 Yep, it’s a draw, though it’s heartening to see both cross the golden 60-fps barrier in all games. Our GeForce RTX 2080 and 2080 Ti review includes a bevy of benchmarks with more strenuous graphics settings and additional resolutions, but the graph above sums it up, really. In traditional games, these two graphics cards are neck-and-neck. There is an exception, though it’s a bit of a niche. HDR gaming displays like the luxurious 4K, 144Hz Acer Predator X27 ($2,000 on Amazon) are still relatively new in the PC space, but gaming with HDR enabled inflicts a performance hit. It’s noticeable on the GTX 1080 Ti, but less so on the RTX 2080. “The Turing GPU architecture improves High Dynamic Range (HDR) gaming performance and input latency using hardware-based compositing, tone mapping, and chroma filtering with HDR surfaces,” Nvidia says. We tested four HDR-enabled games in our RTX 2080 and 2080 Ti review, using both the 8-bit RGB and 10-bit YCbCr422 color spaces, the latter of which uses a compression technique called chroma subsampling. The GTX 1080 Ti suffered an average performance hit of 10.24 percent at 4K with YCbCr422 HDR enabled, while the GeForce RTX 2080 loses 5.89 percent off the top. If you’re gaming at 4K HDR, the RTX 2080 is the better performance option. 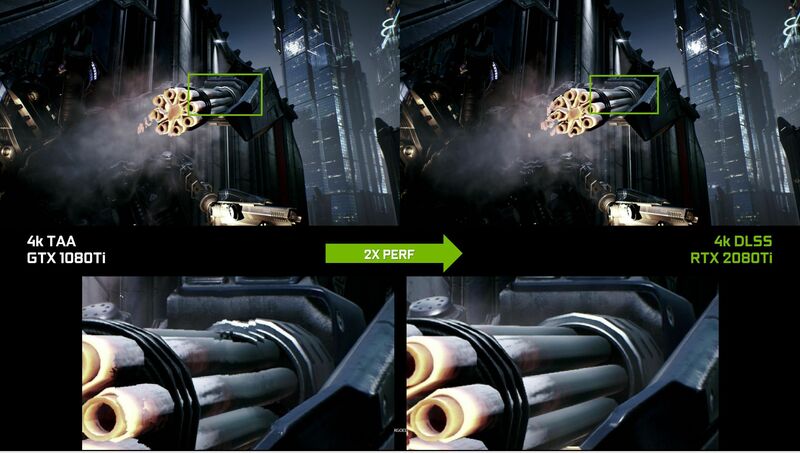 Realistically, though, a 10-percent performance loss at 4K/60 is only 6 fps, compared to 3 fps for a 5 percent loss. You’re unlikely to notice a difference between the two in real-world scenarios. Here’s where the GeForce RTX 2080 puts its best foot forward. 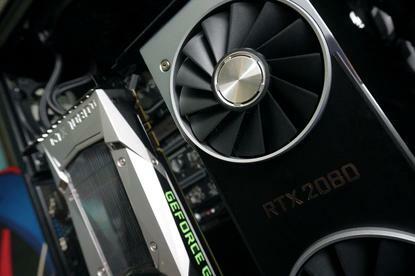 Nvidia built the Turing GPU and GeForce RTX 20-series graphics cards with dedicated RT and tensor cores to allow them to perform real-time ray tracing, and bring the power of machine learning to consumer gaming. The GTX 1080 Ti lacks such dedicated hardware. Read our coverage of Microsoft’s DirectX Raytracing API—which underpins Nvidia’s ray tracing endeavors—for deeper detail about how this “Holy Grail of graphics” works. But in a nutshell, real-time ray traces mimics the behavior of real-life light rays, resulting in more realistic lighting, shadows, reflections, and colors. Traditional “rasterized” shading techniques fake it. Nvidia’s RTX is a hybrid rendering solution, generating most of a scene with rasterization and then finishing it up with ray tracing. The results can be visually stunning, as you can see in the demo videos below. Nvidia sent us the Star Wars demo above for testing. 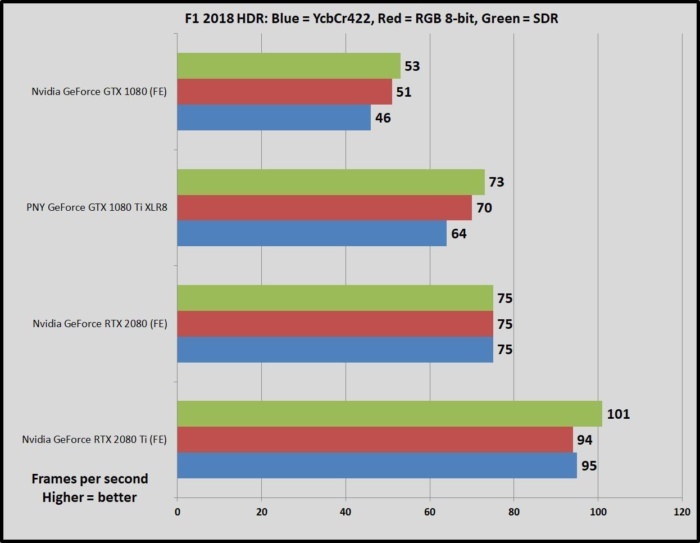 Both the GeForce RTX 2080 and RTX 2080 Ti ran the demo at the full 24 frames per second it was designed for, at both 1440p and 4K resolution, though the RTX 2080 showed slightly more of the noise or “graininess” effect that ray tracing is known for. The GTX 1080 Ti delivered horrible results, hitting 7 to 12 frames per second at 1440p, with much more pronounced noise and jagged edges on objects. If you want ray traced games, you need a GeForce RTX card. Tensor cores excel at machine learning tasks. 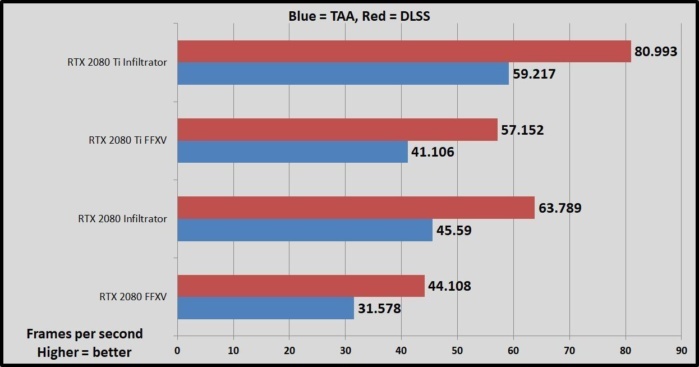 Deep Learning Super Sampling (DLSS) leverages the power of Nvidia’s Saturn V supercomputer to use AI to smooth out gaming graphics, delivering visuals on a par with (or better than) traditional temporal anti-aliasing (TAA), but with a much lower performance impact. Nvidia sent reviewers the Final Fantasy XV benchmark and Unreal’s Infiltrator demo to test. They ran roughly 39 faster with DLSS enabled instead of TAA, on both the RTX 2080 and 2080 Ti, with no loss in visual fidelity. That’s damned impressive, and if DLSS winds up being popular with developers, such a significant boost could break the RTX 2080’s performance deadlock with the GTX 1080 Ti. 25 games have already pledged to support Deep Learning Super Sampling. Here’s a list of every game that will support ray tracing or DLSS. You can dig deeper into DLSS and Nvidia’s other AI-enhanced RTX features in the tensor core and NGX section of our Turing GPU overview. The GTX 1080 Ti can’t use DLSS. But today, the GeForce RTX 2080 can’t really, either. Ray traced games aren’t available yet. Nvidia expects the first ray traced games to appear about a month after the RTX launch, presumably when the Windows 10 October 2018 update adds the DirectX Raytracing API to people’s computers. Nvidia didn’t provide a timetable for DLSS adoption when we asked, though it plans to release the DLSS-infused Final Fantasy XV benchmark alongside the RTX 2080 and 2080 Ti on September 20. 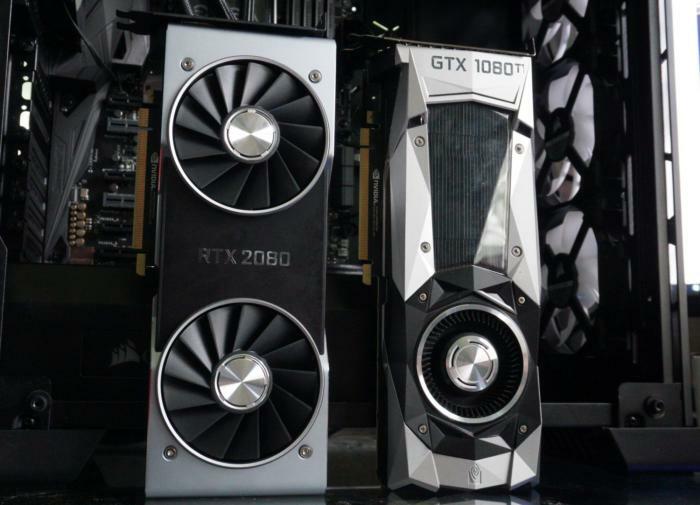 GeForce RTX 2080 vs. GeForce GTX 1080 Ti: Which graphics card should you buy? If you’re looking to spend $700-plus on a graphics card capable of 4K gaming at 60 frames per second, or ultra-fast 144Hz at 1440p resolution, our recommendation is to be patient. Yes, both the GeForce RTX 2080 and GTX 1080 Ti are available now, and waiting is the hardest part. But until ray tracing, DLSS, and Nvidia’s other new technologies can be tested in actual games, we have no idea whether the RTX 2080’s secret sauce is worthwhile. Based on what we can test today, the GeForce RTX 2080 and GTX 1080 Ti perform equally in traditional games, but the GeForce RTX 2080 costs $100-plus more. If you don’t believe in buying PC components based on future performance promises—our advice in general—the GeForce GTX 1080 Ti is clearly the superior option, especially if you can find a deal that brings it down to $650 or less. You get the same performance for a much lower price. 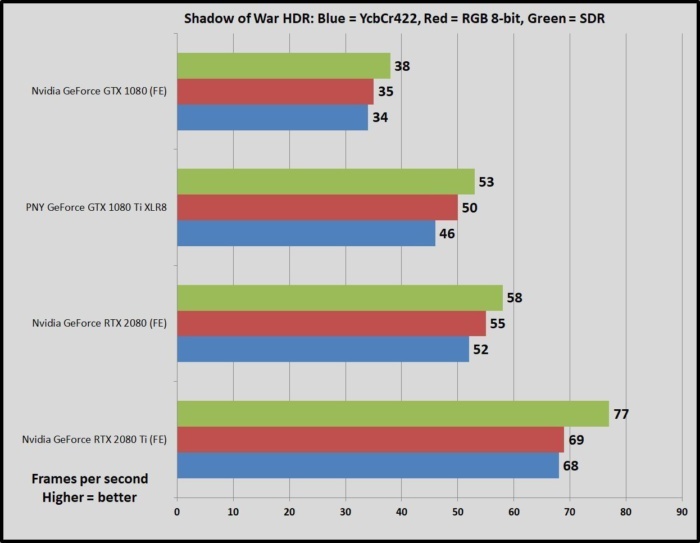 But early developer interest in Nvidia’s as-yet-unavailable ray tracing and DLSS technologies seems high. Every developer I’ve talked to is enthusiastic about real-time ray tracing, even in hybrid rendering form, and 25 games are already lined up to support DLSS. 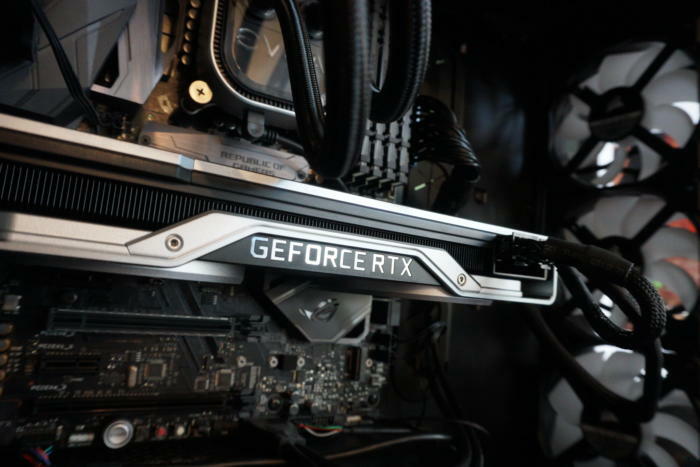 If you believe either technology will become common, it might be worthwhile to invest the extra $100 in a GeForce RTX 2080, especially if you tend to hold onto your graphics card for four or five years. Even if you’re a believer, it might be worthwhile to buy a GTX 1080 Ti for now and let the new technologies bake in the oven for a bit if you swap your card out every year or two. You can find GeForce GTX 1080 Ti cards starting around $700 on NeweggRemove non-product link. We’re partial to the EVGA GTX 1080 Ti SC2 ($690 on Amazon), though all overclocked GTX 1080 Ti cards with a solid cooling system deliver similar performance results. The GeForce RTX 2080 Founders Edition costs $799 on Nvidia.com, and you can find a wide array of customized, overclocked RTX 2080 graphics cards starting around $800 on Newegg.comRemove non-product link. Higher-end models like the MSI RTX 2080 Gaming X TrioRemove non-product link, EVGA RTX 2080 XC Ultra GamingRemove non-product link, and PNY RTX 2080 XLR8 Gaming Overclocked Edition will set you back $850. And don’t forget: Avoid that cheap RTX 2080 with a plastic shroud and a blower-style cooler. You don’t want any part of that.